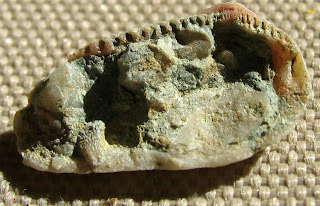 This little clam (2.2 cm long by 1.2 cm wide) is found in the Marble Hill formation of Bedford, Kentucky. The outer shell does not have much detail but the inner part has nice hinge teeth. Thanks to Bill Heimbrock of Dry Dredgers for the identification of Cycloconcha. Read the paper Review of Ordovician Pelecypods by John J. Pojeta. Document is in the DJVU format so you will need a reader program like the Windows version of WinDjView on CNET download.com: CLICK HERE. This pelecypod fossil is from the Ordovician Period.